Russian Nobel prize-winner Aleksandr Solzhenitsyn (1918-2008) is widely acknowledged as one of the most important figures-and perhaps the most important writer-of the last century. To celebrate the centenary of his birth, the first English translation of his memoir of the West, Between Two Millstones, Book 1, is being published. 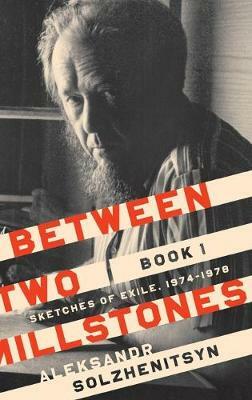 Fast-paced, absorbing, and as compelling as the earlier installments of his memoir The Oak and the Calf (1975), Between Two Millstones begins on February 12, 1974, when Solzhenitsyn found himself forcibly expelled to Frankfurt, West Germany, as a result of the publication in the West of The Gulag Archipelago. Solzhenitsyn moved to Zurich, Switzerland, for a time and was considered the most famous man in the world, hounded by journalists and reporters. During this period, he found himself untethered and unable to work while he tried to acclimate to his new surroundings. Between Two Millstones contains vivid descriptions of Solzhenitsyn's journeys to various European countries and North American locales, where he and his wife Natalia ("Alya"") searched for a location to settle their young family. There are fascinating descriptions of one-on-one meetings with prominent individuals, detailed accounts of public speeches such as the 1978 Harvard University commencement, comments on his television appearances, accounts of his struggles with unscrupulous publishers and agents who mishandled the Western editions of his books, and the KGB disinformation efforts to besmirch his name. There are also passages on Solzhenitsyn's family and their property in Cavendish, Vermont, whose forested hillsides and harsh winters evoked his Russian homeland, and where he could finally work undisturbed on his ten-volume history of the Russian Revolution, The Red Wheel. Stories include the efforts made to assure a proper education for the writer's three sons, their desire to return one day to their home in Russia, and descriptions of his extraordinary wife, editor, literary advisor, and director of the Russian Social Fund, Alya, who successfully arranged, at great peril to herself and to her family, to smuggle Solzhenitsyn's invaluable archive out of the Soviet Union. Between Two Millstones is a literary event of the first magnitude. The book dramatically reflects the pain of Solzhenitsyn's separation from his Russian homeland and the chasm of miscomprehension between him and Western society. Born December 11, 1918, Aleksandr Solzhenitsyn was a Soviet political prisoner from 1945-1953. He set himself firmly against the anti-human Soviet system, and all anti-human ideologies, from that time forward. The publication of One Day in the Life of Ivan Denisovich in 1962 made him famous, and The Gulag Archipelago, published to worldwide acclaim in 1974, further unmasked communism and played a critical role in its eventual defeat. Solzhenitsyn won the Nobel Prize in 1970 and was exiled to the West in 1974. He ultimately published dozens of plays, poems, and novels, as well as works of history, nonfiction, and memoir, including Cancer Ward, In the First Circle, and The Oak and the Calf. Few authors have so decisively shaped minds, hearts, and world events as did Solzhenitsyn. The New York Times called Solzhenitsyn a "literary giant" after his death on August 3, 2008.